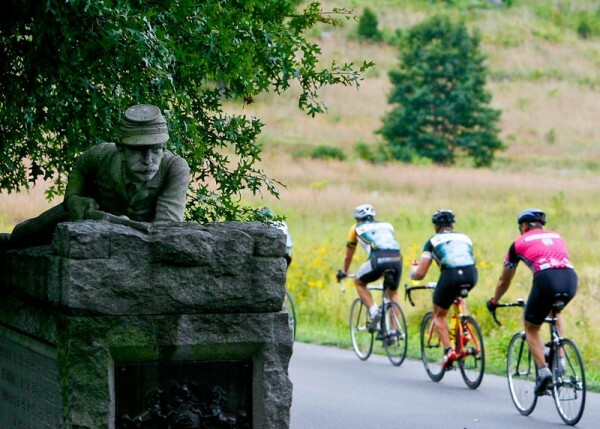 Welcome to the Civil War Century, a 106-mile bike ride with 7000 feet of vertical climbing. We started our adventure near dawn’s early rise and we pedaled directly towards the western slope of the looming mountain rage. It was soon that we started our first of many climbs and it was unending. Slow and steady at least for a few miles. I rode beside a beautiful large meandering stream incased in a garden of greenery: deciduous and conifers trees of every sort with dark green mountain laurel lining the banks. The river ran softly during the lazy days of summer revealing a base of tiny pebbles worn smooth as they tumbled from the slopes above over the millennium. The boulders and rock’s shapes were varied: rhombus, cubic, square and trapezoid leading to the infinity. They wore a soft shell of green colored mosses and a shroud of multi colored lichens raging between hues of grays to dark black. The edges of the hardened rocks were sharp and defined and I wish I could ask them questions from the days of their youth, but they were silent. They trapped the flowing waters and formed quite serine pools where life abounded. It was their pools where life began. Flies, mosquitoes and larva of all kind flourished here. This meandering stream, hosted wild trout. They played in these pools waiting for the tiny flies they would feed on. This slow meandering stream took me back to my youth. As a child, I played in the streams of Loche Raven and would find and play with the crawfish, salamanders, pollywogs and snakes that lived in or around the stream beads beneath the moss covered rocks. It was comforting thinking of those memories and I wondered if those same animals lived under these rocks and boulders. On our way to the top of the ridgeline, we were blanketed in a thick canopy of dense foliage where the crickets, locust and tree frogs sang their many songs, it was humid. It was very peaceful and narcotic, the peaceful existence with nature, and it helped to alleviate the painful experience my pedaling would bring. Their melancholic songs hailed the end of summer moving all life forward hailing the beginning of autumn and then the hard land of winter would arrive- how quickly life goes by. I hate the aging process and I could feel the tug of life pull me forward into the abyss of no return. The tug of life moving us forward is like that of a whirlpool. When young, time moves so very slowly like traveling around on the outside edge of a slow moving galaxy- life seems to slip slowly by like that of a warm lazy summer’s day. Now life goes by like being spun ever so quickly on the deep inside edge of a black hole – it is sucking you down so fast one can not contemplate what is happening. Life now passes far too quickly – our end is before us, as it was written. We finally broke out from the first significant climb onto a ridgeline and we looked across a dark green country shrouded in a heavy leaden covering of mist, rain and billowing ominous clouds. These volumous clouds sailed under the leaden horizon like ghost ships slipping away into the blackness of night. Vapors swirled about on the mountain ridges. They were drifting waves of gray smoke and would suddenly appear then mysteriously evaporate only to return in another form-they were like ghost dancers or specters from some foreign dimension dancing before us- they faded in and out of reality before our eyes –what had they seen over time? I passed many old red wooden barns worn with the passing of time. They were rough hewn, aged and were living many generations ago. I was happy, as I saw free-range: cows, steers, goats and sheep happily meander and graze about these wild country fields. They were free from the horrid conditions of the confines of feed-lot pens and I am grateful to God for that, as we are all Gods creatures, let us not forget that. From these ridge lines we raced down hill, surpassing speeds of 40 miles per hour. The sky was to dark and overcast to wear glasses, so the light rain peppered my eyes and face. It stung my face and eyes like sand from a wind storm at the beach. It was scary racing around these wet mountain roads while it was raining but we were driven onward- who knows why. In the low lands, I rode through endless green fields of wild flora, knee high. They were peaceful, serine and tranquil and endless through time. Like in the Wizard of OZ, when Dorothy slept in the field of poppies, I wanted to lie down in those fields and dream the day away traveling to some lost place like Alice’s Wonderland. As an example, Arden and I attempted to ride our bikes around the world two decades ago and we would befriend a couple or person for a few days. We would become best of friends only to separate a few days later saying how we would stay in touch. However with the passing of time that relationship would fade away like life itself. 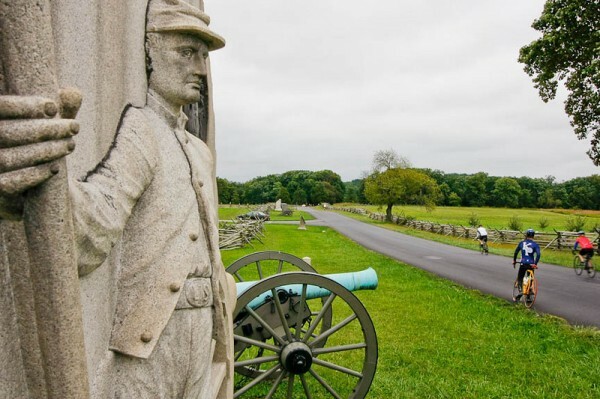 I rode into and through the Antietam and Gettysburg battle fields and passed canons, statues, and memorial markets. Antietam was the bloodiest one day battle in American History with 23,000 soldiers killed in twelve hours. This battle ended the Confederate Army’s invasion into the North. In Gettysburg, I passed Little Round Top where Union snipers cut down many confederate soldiers from the ridge line and other various battle sites and grave stones- I swear in my memory, I could hear the gunshots and screams from the fallen soldiers. I stopped to touch the names of those killed in action on the gravestones. I ran my trembling fingers across the faded names. The markers were of soft marble or stone and were worn smooth to my touch and like our memories over time, they had faded. These men had given their lives for what they believed, this was hallowed ground. I thought about these brave men and women and their life, their families and so on and how it was cut short because of war. So many died and so many suffered, I prayed for them now. For me, war is terrible, ugly, and painful. I am so thankful to God that I never had to bear that burden as all life is hollowed to me and to kill one living creature is difficult. Peace be upon us all. I left this hollowed ground to seek the end of our journey. It was so close you could taste it. 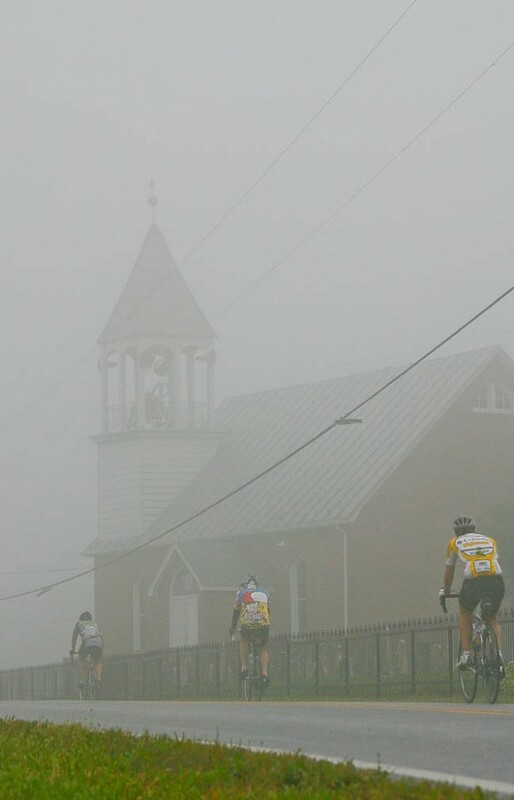 It drew you in like a lost lover you yearned to see, yet it became more difficult to pedal with each passing mile. It seemed to get further away at times. I could feel my legs now; it had already been 80 some arduous miles. I hooked up with this Brazilian and we rode for the next ten miles until he had a flat- I left him alone (I did offer to help)–yet how cruel is that not waiting, yet that is how it works out here- survival of the fittest. The final ten miles I rode with a racer form the Baltimore Bicycle Club. He did not like that I clamped on. He tried to loose me with all his power and might. He would go anaerobic in his quest but I held tight. Eventually we became friends when I offered to pull. I hung in there and I thanked him tremendously at the end. 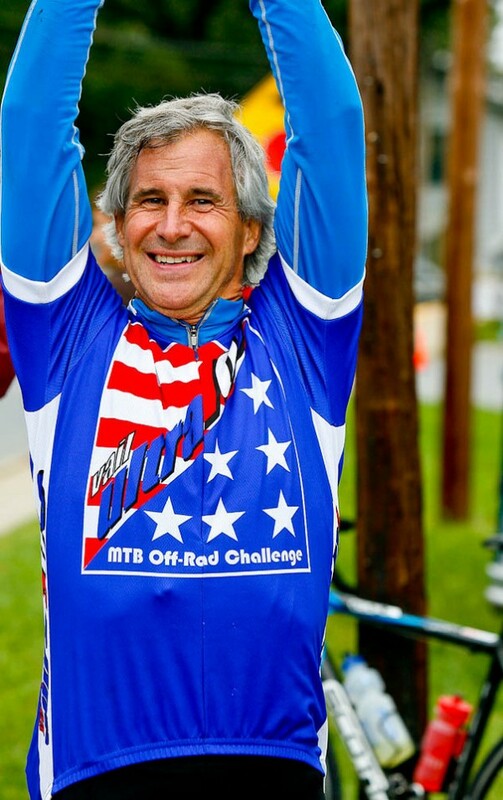 As I came across the finish I felt rejuvenated – a good workout 6 hours 15 minutes including stops. Smiles were on everyone’s face as they crossed the finish line. We all hugged and congratulated one another then broke bread and drank a few beers together, sharing our many tales. I am grateful for the opportunity to engage life and all it has to offer up, seek and you will find. Congratulations goes out to Rob Laws for completing it on a fixed gear single speed. This is truly amazing. 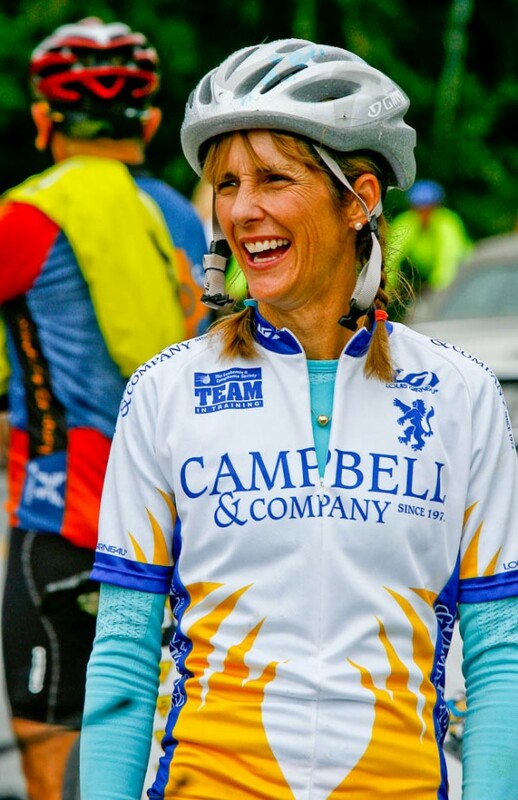 Also congrats to Dave Goodwin, Julie and Pat Miller, Alan Hoff, Harry Gruner, John Mossmiller, Brad Woloson and his friends and Kevin Heerdt and his friends that completed the 106 mile bike event- it is difficult. 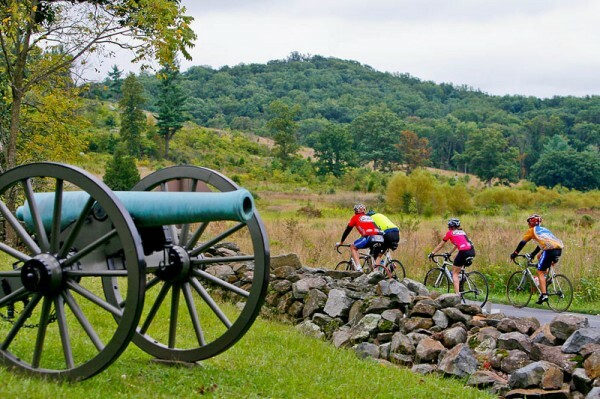 The ride weaved its way thorough three major civil war battlefield: Sheppard’s Town, Anteitam, and Gettysburg. 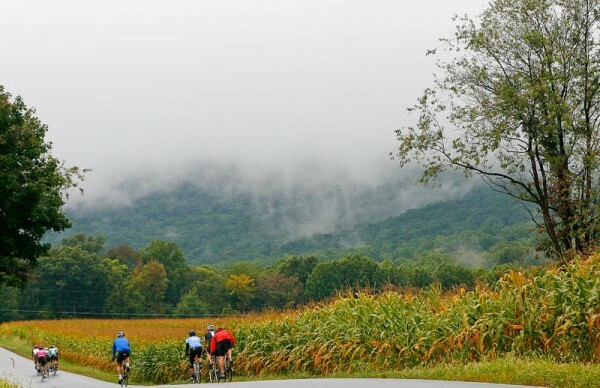 We started from the sleepy town of Thurmont Maryland nestled on the eastern slope of the Cotoctin Mountains between Gettysburg, Pennsylvania and Fredrick, Maryland. The town with roots dating to pre-civil war days had a narrow main street and was lined with old brick colonial buildings. It was a sleepy farming town at one time, now it is a suburb of Fredrick, yet it still has a quaint old feel.